Laptops - they can get hot! And, some may claim they can emit some radiation...but alas, you have to put them on your lap (mostly). Depending on which laptop you have, some get hotter than others, of course, or if you are having a long-winded gaming session, you could experience it more than others. I personally use a MacBook Air, and it stays relatively cool. I've spent the last week adding the DefenderPad to my bag of tricks (both literally, my messenger bag, and figuratively, my awesome bag of tech). Admittedly, I have to remind myself to grab it, but the DefenderPad is designed well to encourage use. It's fairly light, it's rigid, and you can just slide it in your bag next to your laptop. A few years back, I had an angled lap pad that I would rest my Toshiba laptop on, but this is obviously much smaller and can be added to your bag with little addition of bulk. I've never really thought about whether my laptop is causing (or could cause) issues with radiation, however, it being (like cell phones) are such new technologies that we're not sure what will happen over time, but there are studies that state the dangers with the emitted radiation...I now have piece of mind that I'll be protected. At first, I actually felt this item wasn't really anything to get excited about. 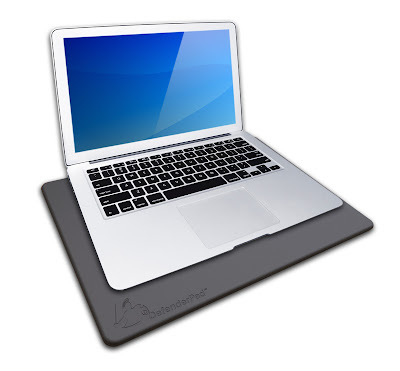 And as far as a piece of tech accessories, it falls pretty flat (pun intended) - it's not all that exciting - but it adds safety, and when I travel for work, I love having the flat, sturdy, rigid surface that is afforded by the DefenderPad. Even for day to day use, I've found myself changing the way I interact with my laptop at the office, while leaning back comfortably in my chair, using the DefenderPad. The only other negative would be the price, which at $89.99 is a bitter pill to swallow. Mashbuttons.com would recommend the DefenderPad as a "buy".